The Seokguram Grotto is a hermitage of the Bulguksa temple and lies east of the temple on Mt. Tohamsan. In 1995 Seokguram was added to the UNESCO World Heritage list together with Bulguksa. It is the 24th national treasure of Korea. It is said to have been built by Gim Daeseong with construction beginning in 751 and ending in 774 shortly after Gim’s death, but it remained virtually unknown. Its last record was of the early 18th century, and it was discovered in a decrepit state in the early 20th century. The Japanese Government-General of Chosen conducted restoration works three times, but it faced humidity problems. After World War II, it was virtually neglected for nearly two decades without taking countermeasures until 1960s when President Park Chung Hee pursued a restoration project. 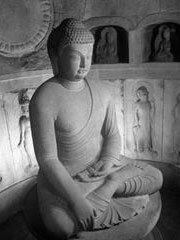 It is a granite sanctuary with a Buddha statue seated in the main chamber. The main hall of Seokguram houses a Bojon statue Bodhi sattva and his disciples. The grotto was built around these statues in order to protect them from weathering. The ceiling of the Seokguram grotto is decorated with half moons, the top is decorated with a lotus flower. Many people come to or near Seokguram to enjoy the sunrise, which is considered particularly attractive. Because of the numerous renovations and the fact that the temple was abandoned for a long time, many details are disputed amongst scholars, such as the exact layout of the original grotto, the buildings in Bulguksa or the shape of the watercourse, which no longer exists, in front of the temple.